ROCK HILL, SC -- Check out this nice video on the top recruiting prospect in the nation, defensive end Jadeveon Clowney, of Rock Hill, SC. He is one of the top targets for Nick Saban this year. He plays football for the South Pointe Mustangs and he is a stud 5 star recruit defensive end that can really be a star at the next level. Word is that he will most likely choose between Alabama & South Carolina. At the moment, he is not saying where he will go, but this video should give you some insight into the world of this top notch college prospect. In the video, you will see him effortlessly take off for a 99 yard TD run and playfully fall to the ground like he is winded. Who ever heard of a defensive end that has that kind of speed? He is fast, he has a tall frame, and he can flat out make a difference in a football game. His coach said he has never seen a player of his caliber before. When asked, all his head coach, family, and friends have nothing but good things to say about J.D (as they call him) on and off the field. True to his name, he is known as a bit of a clown, and well liked socially at his school. He hasn't chosen a school to Naturally, his mother would like for him to stay close to home (what mother doesn't?) but she also said it was Jadeveon's decision. Coaches from over 90+ Division I schools have visited the South Pointe campus to see this special football player. Hopefully, Coach Nick Saban and staff can recruit this top recruit to the Capstone. He could be a defensive end in the mold of the dynamic Copeland & Curry duo in 1992, and be an excellent player to plug into the Marcell Dareus hole after this year. He isn't as big in terms of weight, so he might play the jack linebacker position. If he comes to Alabama, he will fit into the Saban defense nicely and could play early. 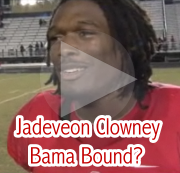 Watch the video below, it should give you a nice look at Mr. Clowney and the potential of his football talent. Hope to snag his signature next February. I should think this kid will fit in just fine with the tide!